It's important to upgrade a ranch house every few years. Changing the roof line or painting the house in a new color scheme can help. Combining interesting exterior materials gives the home a brand-new look. 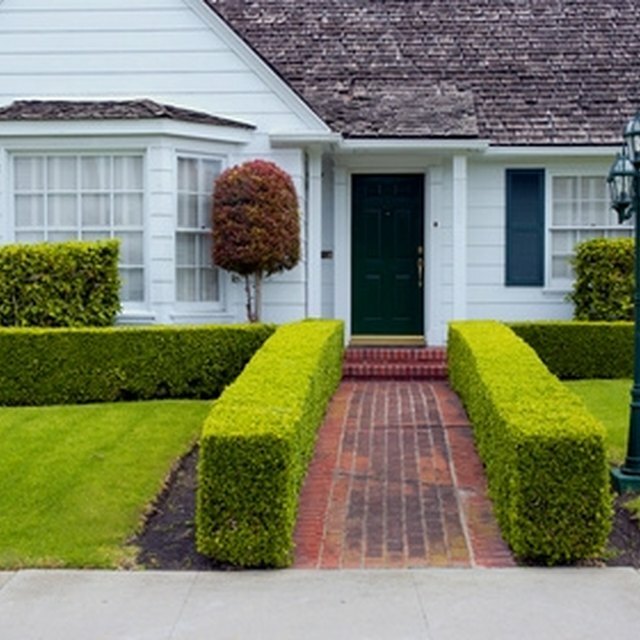 Upgrading landscaping, exterior lighting and driveway areas will erase an outdated look that might be decades old. Consider whether investing a significant amount of money in the project will have an adequate payoff, however. Make sure you can recoup your investment within a few years, if you put the home up for sale. A new front porch can add visual appeal to a standard ranch home. Change the curbside facade. Consider building a front porch, enclosed glass room or two-story addition on one section of the house. Design a new front for a boxy, rectangular ranch to give it a more contemporary look. Review exterior materials, such as stacked stone or brick, that might be added. Paint old surfaces to change the color scheme and add pizazz. Use good-quality primer paint made especially for brick, for example, to change a red brick ranch into a white or cream-colored brick. Buy the highest-quality paint you can afford for the final coats. Paint shutters and house trim in taupe or pale green, for example, for a contemporary look. Install roofing materials in a different texture or color. Use roof materials to give the ranch house a cozy cottage appearance. Add brown cedar shakes for the roof of a white brick ranch, for example. Install a bright blue metal roof if your white brick ranch is near a beach area. Use a green metal roof if the home is in a rural setting in the mountains. Paint the home pale yellow to complement the green metal roof. Build a detached garage right beside the ranch home. Create a sharply pitched A-frame roof, as you face it, on the garage. Use the garage roof angle to provide interesting contrast with the ranch roof. Install the same exterior materials on the garage and add a small home office or apartment upstairs. Add larger windows and French doors. Install bigger windows on the front and back of the ranch house to allow more natural light. Build a deck area in the back of the house, accessible by double French doors leading from bedrooms or dining areas. Add a wall of glass blocks on both ends of the house to allow more natural light as well. Install new exterior post lights in the front of the home along the front driveway. Build a wider sidewalk paved with bricks. Take old bushes and plants and install small rose bushes or evergreen bushes along the front border of the house for a fresh look. Keep in mind that a metal roof is good idea if you use a wood-burning fireplace in your ranch home. Don't use a cedar shakes roof with a wood-burning fireplace, due to the fact that sparks going up the chimney can catch the roof on fire.